Lake Anjikuni is the locale for the disappearance of an entire village. It all happened in November 1930, when a trapper named Joe Labelle was looking for shelter for the night. 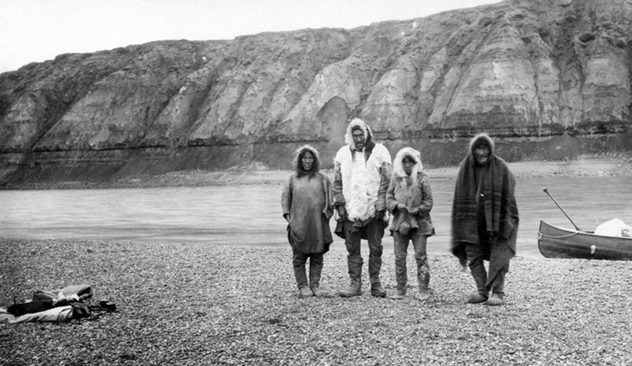 Labelle was familiar with the Inuit village, whose population ranges from 30-2000, depending on who you believe. He made his way there and found quite an eerie scene—the villagers were nowhere to be found. Everything else, including food and rifles, had been left behind. Labelle telegraphed the RCMP and an investigation began. In the Village Burial Ground it was discovered that at least one (sources vary) grave had been opened, clearly not by animals, and emptied. Furthermore, about 300 feet from the village, the bodies of around 7 sled dogs were found, having starved to death despite open stores of food at the village. Some versions of the story even report strange lights being seen above the lake around the time of the disappearance. So what really happened? There have been all sorts of claims about the cause for the disappearance, including aliens (of course), ghosts, and even vampires. The RCMP’s own website disregards the story as an urban legend, but with so many versions of it floating around from so many years ago, it’s hard to be certain. Except about the vampires, I think we can be certain it wasn’t vampires.